Teaser Tuesday is a weekly meme hosted by Should Be Reading. Pick a page and a couple of teaser sentences from that page to share. I learned of it from booksandbarks. Do you believe I am a vampire, Fang? You have asked me this a hundred times, he answered. And I have conveniently forgotten your answer a hundred times. Yes, he wrote. I believe you are a vampire. Why do you believe I am a vampire? Because you told me you are. I took in some air, then typed: I sucked the blood from a dead man last night. There was a long pause before he wrote: Did you kill him, Moon dance? No, I didn't. He was already dead, part of a gang that attacked me. He was accidentally shot by someone in his gang. The shot had been intended for me. I really love this author's work. In this series there are currently 4 books, (Moon Dance, Vampire Moon, American Vampire and Moon Child -releasing July 15th ). In addition the very talented Mr Rain has written a variety of novels, short stories, and screenplays. He is the author of several series. 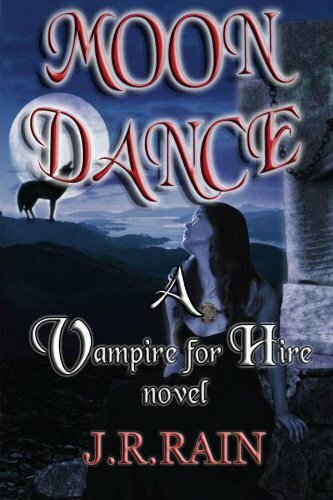 In addition to Vampire for Hire, there are The Jim Knighthorse Series, (mystery); The Elvis Mystery Series; the Spinoza Series, (Vampires); the Grail Quest Trilogy, ( Camelot); The Return of Aladdin Series, ( co-author Piers Anthony); Supernatural Selection Series, (co-author Scott Nicholson); The Cursed Series, (co-author Scott Nicholson), and Vampire Club Series, (co-author Scott Nicholson). He has something to offer everyone so go check him out. Something I learned from his website is he comes from a family of writers. How neat is that? You can find more information about their books on his website. All of their work is available on the Kindle. Novels by J R Rain are widely available. To learn more about him, his work and his family's writings please stop by his website. http://www.jrrain.com . Be sure to sign up for his newsletter while you are there. You seriously do not want to miss a book he puts out!